(Lanka e News - 12.June.2018, 10.30PM) How IqbalAthas was subjected to murder threats to suppress the MiG jet scam of Gotabaya was revealed in the previous article of mine. Some others too getting panic stricken and overwrought by this is not a matter for surprise , when cold blooded murders and robberies of Gota are being exposed with cogent evidence .Even in respect of the last article last week about Gota there were responses from the pro Gota faction. We have only one thing to tell them in plain language : Truth declares itself some day no matter how much it stings . The truth however bitter cannot be hidden forever. What prevails in this world is truthfulness and not falsity. The empire that is built on falsehood cannot last long –it finally crumbles. The upheaval of 2018- 01-08 is a perfect illustration testifying to this truth. If the present rulers seek to conceal the truth they too will perish and the truth will triumph. Therefore it is best that Gota and his clan be warned to face the truth fearlessly as there is no escape from that. Who is the Gothaya (barbarian) who brutally destroyed the prestige of the forces ? The precious prestige of the three forces which was maintained for a long time was violently destroyed by Gotabaya Rajapakse and by no other. The war hero , a four star General who won the war was dragged out and incarcerated . Dozens of Generals with stars who committed themselves to their tasks for 15 to 20 years were most unceremoniously sent home. Gota used the precious public funds to maintain soldiers to hunt down his personal enemies and transformed the intelligence division into another underworld den. Unbelievably , until the SLFP gen. secretary mounted the stage of the UNP he did not know anything about Gota’s ‘intelligence division’ . By these articles , it must be emphasized the prestige of the forces has not been dented because there is no intelligence force in SL which betrays or destroys. Who is Dr. Amith Muneendradasa ? Before the unstoppable tide of the Tigers , the citadel of the government forces began to crumble one by one, the supply routes were blocked and the forces were cornered. America and India also halted the supply of war equipment to the forces and the government’s weapon transactions took place through intermediaries. It is amidst this the Czech government multi barrel weapon transaction took place .The multi barrel weapons were obtained from Czech government through hired Russian planes. The Mossad spy network nucleus is is located within the territorial limits of Azerbaijan , Iran. It was therefore difficult to transport even a nail through Azerbaijan on the sly. The transit airport of Hired Russian plane which carried the multi barrel weapons was Azerbaijan Baku airport. When the plane landed there , a chain of mysterious events followed. The plane that was hid in Azerbaijan Baku city Airport , emerged after two days. By that time the electronic circuit of ‘center command unit’ which was the heart of the multi barrels has been damaged..
By the time the multibarrel weapons were unloaded in SL that was just a mass of steel. If those were to be restored , either a new center command unit had to be introduced (which is almost as costly as purchasing a new weapon) or those had to be dismantled , and the inactive circuits refurbished. It was therefore a great blessing to the nation to have such an expert as Dr.Amith Muneendradasa. Dr. Amith Muneendradasa is a graduate of the Moratuwa University ,and possessed of a doctorate. He was the official proferring technological advice to the forces of the government when purchasing arms. Amith successfully restored the deactivated weapons to the original condition. He toiled for 6 full days working day and night without sleeping to accomplish this task. Janaka Perera who did not delay one minute took the refurbished multibarrel weapons to the security arena. It is thereafter the tidal wave of the Tigers could be stopped. But for Amith the history we are relating now would have been different. Amith’s name deserves to be etched in golden letters in the annals of history. In April 2007 , ‘Lanka Logistic establishment’ compelled the Air Force to purchase an Airplane system sans pilot. The necessary concept paper was forwarded via the ‘Lanka Logistic establishment’. The defense secretary was the also chairman of ‘Lanka Logistic establishment’ , and commanders of the three forces were the ex officio members .Nevertheless , Gota was all powerful while the commanders were merely his puppets What Lanka Logistic establishment tried to do was , somehow force a ‘ ‘Blue Horizon 2’ airplane system sans pilot made in Israel down the throat of the Air Force.The company that produced it was, ‘E.M.I.T Aviation consultants’ , an Israel Co. The Air Force however was of the opinion this was a white elephant and a money wasting exercise. Their view was based on the report of the six member committee appointed by the Air Force Commander.The committee of 6 members included Air force Commodore P.B. Ratnayake and U.A.V commanding officer M.D. J Vaas. Besides , a skill display of the aircraft was also not made , the Air Force report further stated. Gota on the other hand exerted unrelenting pressures on the Air Force towards this transaction. Gota planned to conclude the transaction in the second quarter of 2007 so as to line his pocket with many million dollars commission. Since 1991 it was Amith Muneendradasa who was the official providing technological advice to the government’s forces when purchasing weapons. Amith however was absolutely opposed to this deal . He said he cannot sign in favor of a transaction which constitutes plunder of public funds. But because of the intense pressures from Gota and the defense ministry, on 6 th June 2007 , Amith had to travel to Israel. After landing in Israel he took lodging in ‘Tel Aviv Marina ‘Hotel. The fate of the U.A. V. deal was hanging on Amith’s signature. The local representative in this transaction was Arjuna Gunawardean another Gota’s sidekick. ‘Protect Risk management solutions Ltd’ was the company he represented which was a fake Co. in Britain.. This Co . was another fake Co. like ‘Belimissa Holdings’ which is non existent . The parent Co. E.M.I.T Aviation consultancy , Israel was a rejected registered Co. On 9th June 2007 , the inspection of the U.A.V. plane test run was carried out before Amith by the Israel Co.. To Amith these were trifling subjects . Amith without further delay threw out this transaction which had already been rejected by the Air Force. Amith was hospitalized on 2007-06-11 suddenly and following day it was announced he was dead. Amith was admitted to Aiklov hospital , Tel Aviv and the cause of death was declared as Pneumonia . According to his family members , Amith did not have any ailments. Never had he taken western medical treatment, and his choice was ayurveda treatment .Amith who was mentally and physically fit contracting pneumonia in Tel Aviv was a mystery. The family members insisted on a post mortem examination from the SL government. However when Amith’s remains were fetched to SL what happened was an entirely different thing. The post mortem was refused and the defense ministry pressurized the family of the deceased. An unofficial censorship was imposed on the funeral ceremonies. Mass media coverage was restricted. A number of doctors – his contemporaries in the class attended his funeral . Irrespective of the pneumonia tale , their opinion was , Amith’s death was due to some poison entering his body. 6 days after Amith’s death , Lanka Logistics took steps to pay half the amount of the total sum involved in the transaction that was rejected and Gota violating the establishment code concluded the transaction. That was how the Blue horizon 2 pilot sans airplane system was got down from E.M.I.T Aviation consultancy after paying US dollars 6.5 Million . The competitive price range was much less and was half of the price at which the agreement was signed. The U .A.V transaction was an exact carbon copy of the MiG jet transaction . 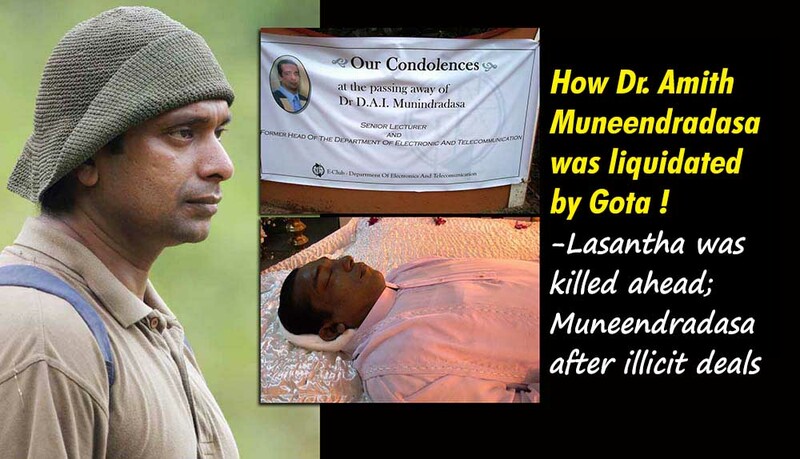 Lasantha was murdered before the MiG jet transaction . Amith Muneendradasa was murdered after the U .A.V. transaction. Gota used his discretionary powers ,but it was Amith who was the stumbling block in the weapons deal through Lanka Logistics . Amith had rejected many of the weapons deals which were negotiated by Gota. Though the commanders of the forces were serving as mere rubber seals for Gota the traitor , Amith acted fearlessly as a patriot. At the concluding stages of the Eelam war , the land deeds given to the commanders of the forces were not in recognition of their services , but rather those were bribes. Those were bribes to silence them permanently as they were partners in the irregular illegal transactions done by Lanka logistics. There are more grounds and evidence to support that Amith was murdered. In the first half of the year 2007 , a member of Karuna faction had the need to photograph a house in Panadura on a particular day. In that connection he sought the writer’s assistance . He went with me to Pirivena Road , Pinwatte , Panadura and took photographs of that house. Some months later Amith passed away. When the writer went to pay the last respects to Amith’s house he realized without any difficulty that was the house the member of Karuna’s group photographed. It became very clear therefore what was the contract that had been entrusted to Karuna’s group. An individual like Dr. Amith Muneendradasa was a most valuable asset to the country , and deserved to be safeguarded and decorated. But the defense ministry on the contrary on purpose sent vehicles of the forces without number plates to his home and exposed him . This drew heavy flak from Amith . While the suicide bombers were on the rampage in Colombo ,the defense ministry was trifling with his life not for nothing. If the first plan does not work by some chance , the next plan was to be implemented. That is to silence Amith even through a bomb attaching a tiger label. Dr. Amith Muneendradasa was one with an exceptional level of intelligence and a true patriot . He was offered opportunities on several occasions to come and take over a high rung job relating to security in Israel. Once he was offered a high profile position in Tel Aviv University too. When he was a technological advisor to the SL government forces, he was offered santhosams (bribes)worth millions. Lanka logistics was trailing behind him to lure him with santhosams . Amith’s answer to all those was : he learnt out of the innocent people’s funds , and his objective is therefore to repay those debts and not to amass wealth. He always said until death that he would serve his motherland. Gota who liquidated such an erudite valuable patriot , is now building castles in the air to come to power through Viyath Magaval . Nothing is more ludicrous and ridiculous than this pipe dream. .
-A former Intelligence division officer.